Check out this post on the Head First C# forum. One of our readers, Styrkar, wrote a really neat program that takes any text and turns it into a nifty little animation. He did it as a way to extend the Space Invaders Lab to make a cool animation for the “Game Over” text. Okay, I just want to say how cool that is. 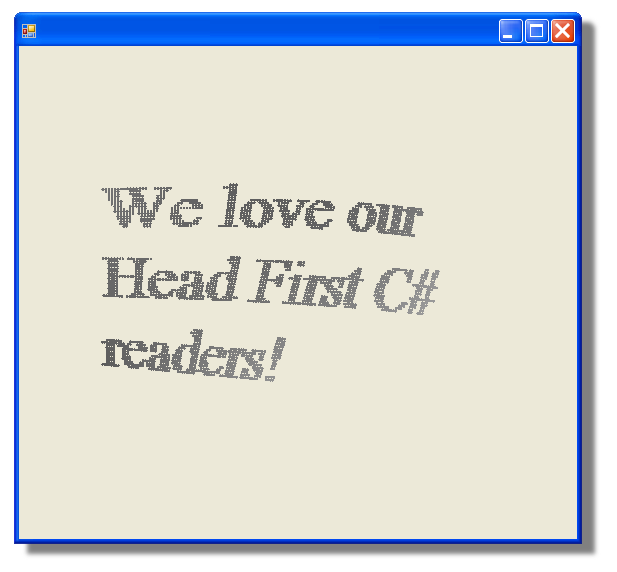 When we wrote Head First C#, one of our goals was to give readers a starting point for their creativity. I figured we’d see a few little modifications to the programs in the book. But seeing stuff like this… well, it’s just really amazing to me. Not only is this a cool program, but the code is really good. It’s readable, efficient, and easy to follow. And it’s even well-encapsulated — it’s good object oriented design! I really hope Styrkar gets the rest of the lab finished — I can’t wait to see how it comes out. < Previous Don’t document your process! Next > Head First C# – the top-selling C# book on Amazon!